I knit this together for a little girl granny because she had no time to knit itself. It is with pleasure that I knitted this beautiful model and I was able to shine the eyes of this little girl happy. It's wonderful to dream a little girl and give pleasure just by the knitting. What a lovely gift you knitted! It is so cute on the doll. You did a lovely job of knitting. Enjoy making your next pattern. Lovely doll and beautiful work! Nice to see my pattern knitted by all of you! How thoughtful of you to share your knitting talents with your friend, so that her granddaughter could have such a lovely outfit to cherish! Your knitting is beautiful. The outfit is so lovely. You are a very kind friend! I'm sure the little girl will treasure the lovely outfit. This is beautiful! It is so kind of your to make this for someone else. It is an exquisite gift of friendship. Your doll outfit is so sweet and how kind of you to knit for some one else. It is such reward to see the pleasure in the childrens eyes when they see the lovely clothes. Te voir publiée ici, une véritable consécration. Join in and write your own page! It's easy to do. How? 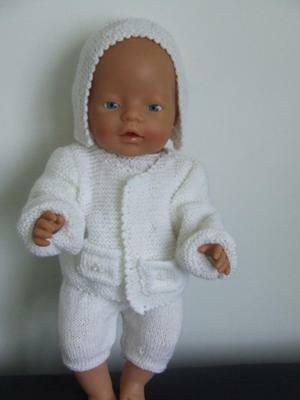 Simply click here to return to Your Own Favorite Doll Knitting Pattern Page.